Hi! My name is Dougie. I know I look kinda worried in this photo (the lights were in my eyes! ), but I am actually a really sweet, happy little guy. I'm about 3.5 pounds. The only thing that used to worry me was that I was a special needs rescue bunny who desperately needed dental surgery. I had teeth that don't line up right. It's called a mallocclusion. It's not my fault. I was born that way! So, the doctor removed all 6 of my front teeth(four incisors and two peg teeth). It was scary for a while, but now I am doing well and am almost healed! Now, I can eat and enjoy my food and am able to groom myself. The bonus for you if you adopt me is that I can't chew your electrical cords! My surgery and recovery have cost close to $1000. The Rabbit Haven helped SaveABunny rescue me and donated $600 toward my surgery. Thank you Auntie Heather and the wonderful people at The Rabbit Haven! If you'd like to add to my bunny trust fund I'd be very grateful. It will help all of us at SaveABunny a lot and allow us to rescue rabbits in need, like me, who would otherwise be euthanized. 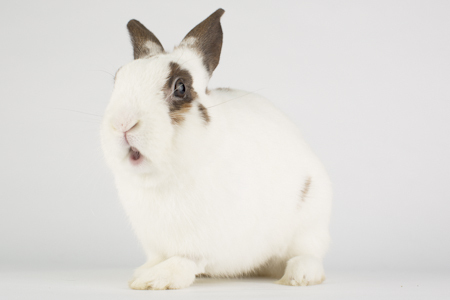 Did you know that a bunny's teeth grow constantly throughout their life? Usually they are ok and a good diet of orchard grass hay or timothy hay will hep keep the teeth healthy. But that won't work for me. My situation is too serious. Thank you for reading my story and caring about me!